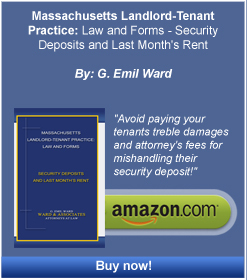 Appellate Practice - Boston Real Estate Attorney. Eviction Law. Zoning and Variances. Housing Discrimination. Ward & Associates has successfully pursued appeals in the past, such as PGR Management. Co. – Heath Properties v. Credle, 427 Mass 636 (1998). This case established that an attorney’s lien for fees was superior to any claim the judgment creditor landlord had to funds escrowed by the tenant during litigation, where the tenant prevailed on at least some of his or her claims. We are presently in the middle of a class action appeal involving the security deposit defense on which claims Ward & Associates prevailed at the trial court level.